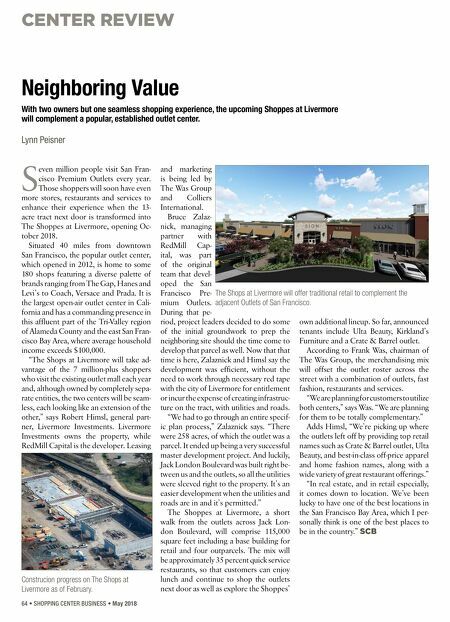 CENTER REVIEW 64 • SHOPPING CENTER BUSINESS • May 2018 S even million people visit San Fran- cisco Premium Outlets every year. Those shoppers will soon have even more stores, restaurants and services to enhance their experience when the 13- acre tract next door is transformed into The Shoppes at Livermore, opening Oc- tober 2018. 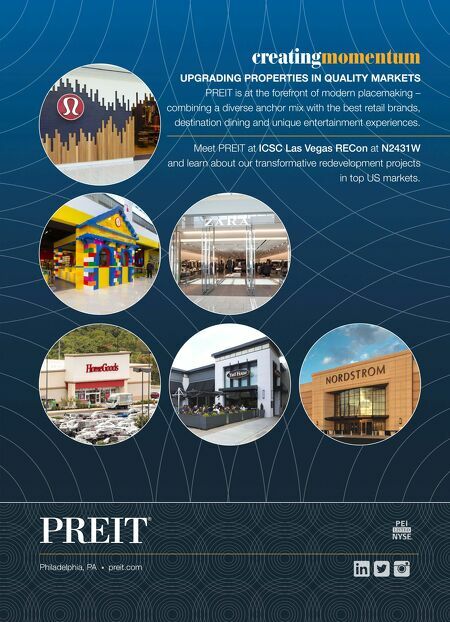 Situated 40 miles from downtown San Francisco, the popular outlet center, which opened in 2012, is home to some 180 shops featuring a diverse palette of brands ranging from The Gap, Hanes and Levi's to Coach, Versace and Prada. It is the largest open-air outlet center in Cali- fornia and has a commanding presence in this affluent part of the Tri-Valley region of Alameda County and the east San Fran- cisco Bay Area, where average household income exceeds $100,000. "The Shops at Livermore will take ad- vantage of the 7 million-plus shoppers who visit the existing outlet mall each year and, although owned by completely sepa- rate entities, the two centers will be seam- less, each looking like an extension of the other," says Robert Himsl, general part- ner, Livermore Investments. Livermore Investments owns the property, while RedMill Capital is the developer. Leasing and marketing is being led by The Was Group and Colliers International. Bruce Zalaz- nick, managing partner with RedMill Cap- ital, was part of the original team that devel- oped the San Francisco Pre- mium Outlets. During that pe- riod, project leaders decided to do some of the initial groundwork to prep the neighboring site should the time come to develop that parcel as well. Now that that time is here, Zalaznick and Himsl say the development was efficient, without the need to work through necessary red tape with the city of Livermore for entitlement or incur the expense of creating infrastruc- ture on the tract, with utilities and roads. "We had to go through an entire specif- ic plan process," Zalaznick says. "There were 258 acres, of which the outlet was a parcel. It ended up being a very successful master development project. And luckily, Jack London Boulevard was built right be- tween us and the outlets, so all the utilities were sleeved right to the property. It's an easier development when the utilities and roads are in and it's permitted." The Shoppes at Livermore, a short walk from the outlets across Jack Lon- don Boulevard, will comprise 115,000 square feet including a base building for retail and four outparcels. The mix will be approximately 35 percent quick service restaurants, so that customers can enjoy lunch and continue to shop the outlets next door as well as explore the Shoppes' own additional lineup. So far, announced tenants include Ulta Beauty, Kirkland's Furniture and a Crate & Barrel outlet. According to Frank Was, chairman of The Was Group, the merchandising mix will offset the outlet roster across the street with a combination of outlets, fast fashion, restaurants and services. "We are planning for customers to utilize both centers," says Was. "We are planning for them to be totally complementary." Adds Himsl, "We're picking up where the outlets left off by providing top retail names such as Crate & Barrel outlet, Ulta Beauty, and best-in-class off-price apparel and home fashion names, along with a wide variety of great restaurant offerings." "In real estate, and in retail especially, it comes down to location. We've been lucky to have one of the best locations in the San Francisco Bay Area, which I per- sonally think is one of the best places to be in the country." SCB Neighboring Value With two owners but one seamless shopping experience, the upcoming Shoppes at Livermore will complement a popular, established outlet center. Lynn Peisner The Shops at Livermore will offer traditional retail to complement the adjacent Outlets of San Francisco. Construcion progress on The Shops at Livermore as of February.